So you’ve been looking at that sideboard in your dining area for weeks now, thinking about how outdated it looks and how it no longer fits in with the décor of your home. Each weekend comes and goes in the blink of an eye, but the sideboard remains. Is it worth the effort and hassle of going to buy a new one? Or is there another option? Upcycling has become a huge phenomenon which has engaged the globe, and you are the one who can give your old furniture the need lease of life it needs. Paint spray guns are quickly becoming a firm favorite of the most elite handyman (or woman) as they provide a professional finish with very little effort. But there are a lot of them on the market and it can be quite a daunting task to find the right one for you. But never fear, we are here. We have found the top-rated sprayers that will have your forlorn looking furniture looking brand new! What Type of Spray Gun is Best? Price Guide: How Much Should You Spend? Spray Guns Only – Compressor Needed! Paint Sprayers might not seem like the obvious choice when painting furniture, but they should be your top choice. There are many reasons that paint sprayers are your best way to get the job done. First of all, they are highly portable and take up very little room when not in use. There is also a wide variety of sprayers that you can choose from. This allows you to customize what you purchase according to your budget, skills and painting needs. Paint sprayers are phenomenal at spraying an even coating, especially when working on uneven surfaces. This makes those pieces of furniture with detail work and carvings much easier to get done. Paint sprayers atomize paint so it flows in a fine mist. This creates a mirror-like finish on your furniture pieces. Finally, paint sprayers can apply a wide variety of materials. 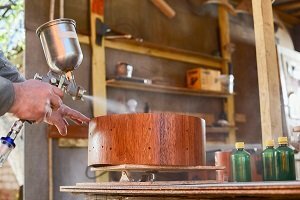 Whether you are using lacquer, stains or latex paints, you will find that it is easy to complete your painting projects with a decent sprayer. Paint sprayers are going to cost more than brushes, rollers or spray paint cans. The value behind a sprayer makes the cost well worth it. There is less mess and the sprayer can be used for years to come on any DIY project. In addition, spraying with a spray paint can become tiring and often cost more than you expect. Painting with brushes is a good idea if you want more control and neatness to your project, but normally, the paint sprayer makes more sense. You have two main choices when looking at paint spray guns; the airless models and HVLP sprayers. These two varieties are vastly different which is why many people find the need to have one of each in their arsenal. The HVLP paint sprayer stands for high-volume, low-pressure. This means that the air gets pumped from an air compressor and the turbine atomizes paint. In an airless sprayer, the piston is responsible for pressurizing the material and then it sprays from a small opening. That high pressure pushing out of the small space essentially shears the paint until it is in tiny particles. Airless sprayers are best for big, flat surfaces. They work well when painting walls, siding, and other exterior jobs. HVLP sprayers are designed with fine finishing situations in mind. They are ideal for handrails, doors, cabinets, and furniture. Airless units offer a product transfer rate of just about 50 percent but they are more powerful. HVLP units offer product transfer rates of up to 90 percent. Because of the lower amount of overspray with an HVLP sprayer, this is a better option when dealing with expensive paints. There is a paint sprayer for anyone’s budget. The trick will be to find one within your budget that will also accomplish the projects you need to be done. Paint sprayers start at well under $50, but it isn’t going to be a model that will work well for large, long-term painting projects. In addition, the quality of these lower priced models won’t be as durable as something with a higher price tag. The further end of the spectrum offers top of the line sprayers for several hundred dollars. While these are going to last for a long time and paint over multiple surfaces, not everyone needs something this powerful. There are many makes and models for different budgets and projects. You can find more detailed reviews below. This paint sprayer is currently number one on Amazon’s Best Seller list for paint sprayers, which speaks for itself. The Homeright C800766 allows you to adjust the spray which results in optimum precision; perfect for the intricate corners which allow for full coverage. The needle is made from brass which helps the spray gun last longer and ensures that the finish is even and without brush marks. You do need to thin the paint down if you are using thicker oil based paints, and always make sure that it cleaned out properly after each use to stop it clogging up but you will find this with most paint spray guns. This tool seems to be an all-around favorite for those who want to spruce up doors, cabinets etc. with ease. Graco tools are always designed and executed with quality in mind. This True Coat II is the best high-performance electric sprayer on the market. Unlike the Homeright, this was designed to last years and rival the performance of larger airless spray guns. One of the big pros to this spray gun is that it comes with an instructional DVD and storage case. Simply put, you do not want to spend your time and effort in a project without the correct instructions which best suit that product, or a place to store the tool to prevent wear and tear. Another bonus of this spray gun is that the parts are easy to acquire to prolong the integrity of your spray gun. Once again it is quite pricey, but it has a “Tilt-N-Spray pendulum’ which provides plenty of motion without losing any of the power. The Truecoat II is a high-performance airless sprayer. It is unique because most quality spray guns for furniture are HVLP sprayers. The technology and trusted Graco brand make this an excellent choice for those who want to spend a little extra. Another Amazon Best Seller, this one placing at number 5 but with an impressive 507 reviews. This spray gun boasts that it can spray an 8ft. by 10ft. a surface in 1-5 minutes and can spray up to 8.0 gal. per hour. It is perfect for spraying both vertical and horizontal and as long as it hasn’t got a full load of paint in it, it is light and therefore easy to maneuver. One plus point that this sprayer has over the HomeRight is that it is powerful enough so you do not need to dilute thicker latex paint. One thing to note though is that it is worthwhile doing a practice run first, as it can produce blobs when first used due to the power. Priced in the mid-range of sprayers for furniture, the Flexio 590 is great for home DIYers who want to spray medium to large sized wooden furniture. This is undoubtedly the best battery powered paint sprayer in 2017. It has 30% faster charging times and comes with 2 batteries, meaning you’ll get your work done very quickly. The 3-LED fuel gauge system allows immediate feedback on the state of the current battery charge. Spraying up to 1-gallon of paint with each charge, which is fantastic. You don’t need to sacrifice quality when you go cordless. This sprayer offers a perfect airless finish and you don’t need to thin your materials first. The spray gun will also support a 0.008 – 0.016 spray tip. Unlike many other brands, this Graco is fully repairable to extend the life of the unit. Even though it does not run on electricity it has plenty of power. 500-2000 PSI is excellent for furniture spraying. Wagner produces several different spray guns, all for different tasks. The control spray double duty is a solid machine for many of those tasks. This spray gun is designed for both indoor and outdoor use, which means that your garden furniture will not be left forgotten. Its flow trigger means that you can control the amount of paint you’re using for different tasks. This spray gun is very easy to disassemble and clean with just hot soapy water which makes the whole clean-up process a lot less hassle, which is a winner in anyone’s book! This spray gun is a High Volume, Low Pressure which allows it to spray materials like lacquers and stains with ease, providing a professional-looking finish. It is a lot smaller than a lot of the other spray guns on the market which makes it much lighter and excellent for reaching the more difficult areas. It comes with different metal cups and nozzles which allow for different types of applications, depending on your project. Placed at number 9 on Amazon’s Best Seller list, it is clear this tool is a true contender for your spray gun favorite. It is the big brother of the double duty sprayer above so if you want a little extra power then this is for you. This tool is for the avid furniture paint sprayer and it’s towards the top end of the budget. But you do get a lot for your money. It comes with a 1 and a 5-gallon paint bucket which makes it perfect for big and small jobs alike. It boasts an RAC IV SwitchTip so you can reverse the tip if the gun becomes clogged so you don’t need to stop the task in hand. This is a huge bonus when it is compared to similar spray guns on the market as clogging seems to be a universal issue with spray guns. If you are just starting out, I would say that this is not the gun for you. However, if you are a seasoned sprayer, this is definitely the professional option. It works great with furniture but also can easily cover walls, fences, decks and basically anything at home. If you are just getting into the art of furniture rejuvenation and don’t want to spend over the odds for something you’re not sure if you will continue, then this is the spray gun for you. Now, this does by no means that it is not worthy of some of the more expensive spray guns, but it is a starting point that won’t break the bank. Similar to the other paint spray guns, it provides an even coat of paint without wasting your valuable time. However, I will admit, it does look a lot more rudimental than some of the other options on the market but once again it is on Amazon’s Best Seller’s list which speaks volumes. I will start by saying this is not a fancy looking spray gun. However, I do admire the quaint look it has. This spray gun comes with a glass Mason jar and is made of metal, whilst several of its competitors have opted for the more modern plastic route. It does require you to purchase a ¾ hp compressor separately but I feel like this isn’t a spray gun just to get the job done. `This is for someone who enjoys the task of spray painting itself. This is for someone who enjoys the task of spray painting itself. This little gun will by no means spray your house top to bottom, but for those little jobs, it adds the air of antique to a modern-day task. Overall, I cannot tell you explicitly which spray gun you should get for use with furniture as it is totally dependent on what project you are working on. Like with any tool, there are a lot of factors that you need to take into account before making your choice. And as several of the spray guns are quite expensive, you don’t want to make a frivolous mistake. Amazon reviews are an excellent way to help decide which spray gun would be the best for you. Many of the users go into detail about the projects that they have undertaken and the results that particular spray gun produced; it may even give you a few more ideas! I have used and tested all of the products above so hopefully it helps you make the best possible choice. Ultimately, with whichever spray gun you decide to purchase, this tool can provide endless enjoyment, save masses of time and give your furniture a new lease of life with a personal touch.